The Orbiting Astronomical Observatory satellite allowed astronomers to view the universe from outside Earth's atmosphere. In this historic photo from the U.S. space agency, the assembly of the Orbiting Astronomical Observatory (OAO) for shroud jettison tests seen in the Space Power Chamber (SPC) at Lewis Research Center, Cleveland, Ohio on June 24, 1965. Lewis is now known as the John H. Glenn Research Center at Lewis Field. The SPC consisted of two vacuum tanks that were created in 1962 inside the former Altitude Wind Tunnel. 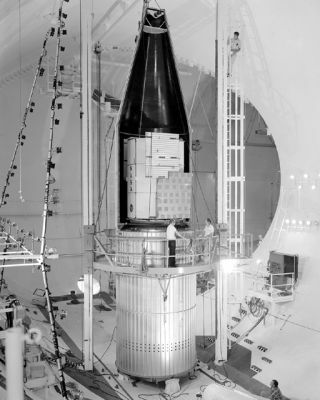 The OAO satellites, launched on Atlas-Centaur and Atlas Angena rockets, were the first to allow astronomers to view the universe from above the Earths obscuring and distorting atmosphere.